Dye your khaki pants a completely different color in minutes. 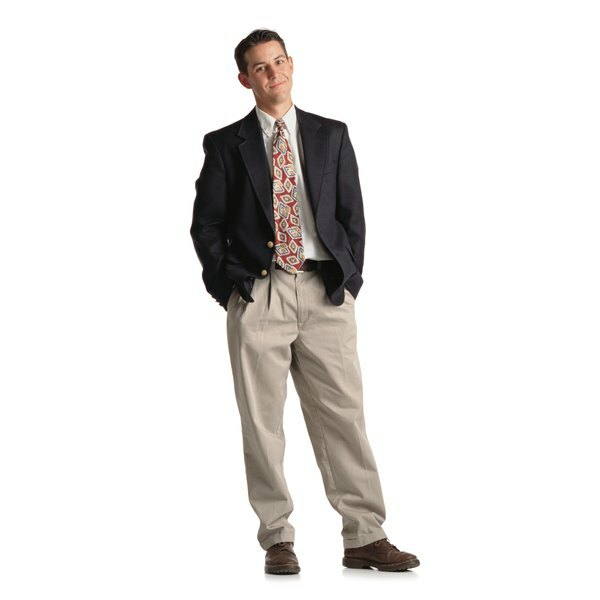 Khaki pants are casual but still appropriate for work. Unfortunately, the tan color cannot camouflage stains. You can save a stained pair or expand your wardrobe options by changing the color with dye. Khaki should only be dyed a darker color like navy or black or a darker brown. If you want to dye your pants another color that's not significantly darker than khaki, the resulting color may be muddy. Preserve the new color by turning your pants inside out before you wash them. Fill the plastic tub with lukewarm water and place the pants in the water for five minutes. Remove the pants from the water and wring them out. Place them on a plastic bag. Empty the plastic tub. Fill the plastic tub with warm water. Pour the dye and the salt into the water. Stir with a chopstick until the dye and salt are both completely dissolved. Shake the pants to remove wrinkles and place them into the dye bath. Swirl the pants around in the dye bath to make sure all the fabric has absorbed some of the dye. Take the pants out of the dye after 45 minutes. Empty the dye bath and refill the plastic tub with water. Rinse the excess dye out of the pants. Put the pants in a dryer on the low setting to set the dye. You may need several rinses to get all the excess dye out of the pants. Do not use hot water because the pants may shrink. Rianne Clarke-Martin started writing in 2006. She has written for Pacifica.org, and also for WNSR radio. Clarke has a Bachelor of Arts in media studies from The New School, and learned fashion-accessories design at the Fitness Institute of Technology.